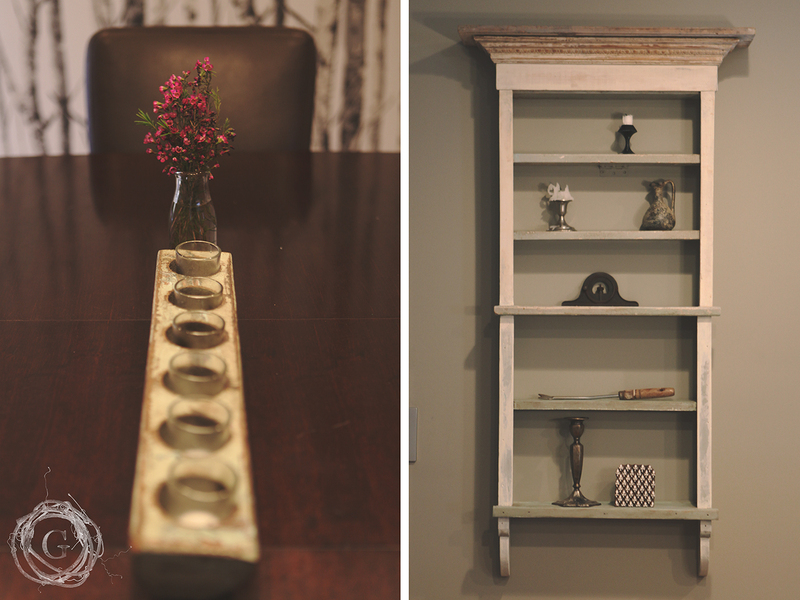 There are many reasons to use antiques in your home decor. Repurposing an item keeps your carbon footprint down and is a great way to prevent more going into a landfill. And since antiques were often made of better materials and with better quality, you are making a good investment. It is a way to tell consumerism to take a hike…you are buying something sturdy, tested over time, and made to last. It can be easy to let antiquing take over your life. Getting into a bidding war happens way too often. It is tough to leave an item you kind of want because if you don’t buy it then, it will be gone the next time you visit the shop. Once you start collecting a specific antique it is very easy to go overboard and buy way too much. So…there are some easy restrictions to set in place to make sure this passion doesn’t take over your life or home. 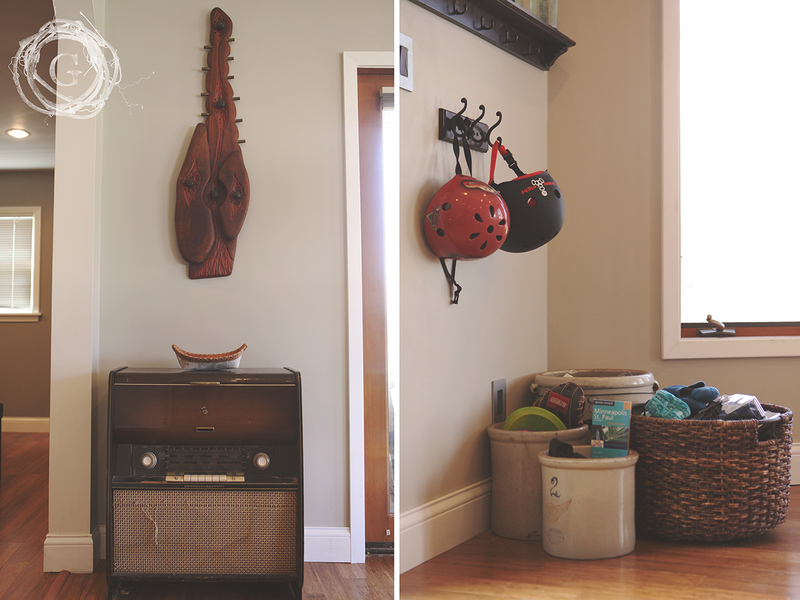 An uncluttered house is very important for my sanity. Visual clutter turns my brain to mush and makes life seems so much more hectic and out of control. I’m by no mean a neat freak, but definitely like things put in their place. So a ton of small kitchsy items doesn’t fit with our family’s happy mode, which means I need to be a very careful, purposeful, prudent antique shopper. Basically, the rule is that if I’m going to buy an antique, it needs to serve a purpose. I allow myself one small cabinet for decorative pieces, mostly candlesticks and vases, and after that, anything I buy needs to have a practical and immediate use. Here is an image of our freshly finished kitchen hand built by John which combines industrial, modern and farmhouse design. The orange dutch oven, wood bowls, crockery, trivets and a french match box are all antiques and some of our most frequently used items. The decorative piece on the soffit is part of an old farmhouse. The only expensive purchase was the matchbox, found on etsy, but I love it and use it often and it just makes me so happy. In the dining room, I have a centerpiece candle holder (the kids love candlelit dinners) that is actually an antique wooden mold purchased in Savannah and fresh flowers in an old milk bottle. The shelf on our wall used to be a window from a house in Duluth and was half antique white and half bubble gum purple. Michelle from Rudy’s Event Rentals is an expert faux painter and touched up the shelf so now it all matches and looks amazing. I designed this shelf using my favorite aesthetic called Wabi Sabi, a Japanese term that embraces asymmetry, simplicity, and modesty. We use the weeding tool and candlesticks regularly, the vase is from my sister from her travels, the level was John’s grandfathers, and the antique wood block was used in India for making fabrics. 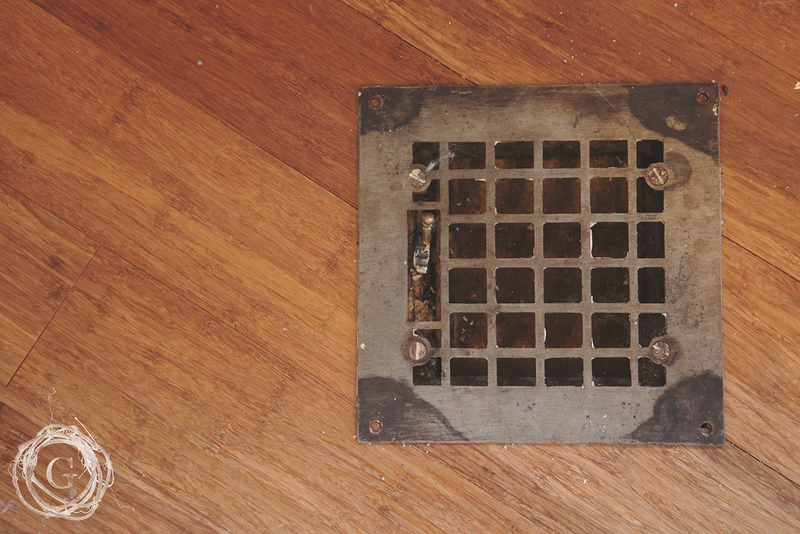 This floor grate were purchased at Bauer Brothers Salvage (we did the math to make sure they were the right square footage for letting the HVAC work properly), and it adds a bit of history and age to our kitchen. Pieces like this are often cheaper and much higher quality than modern store bought ones. 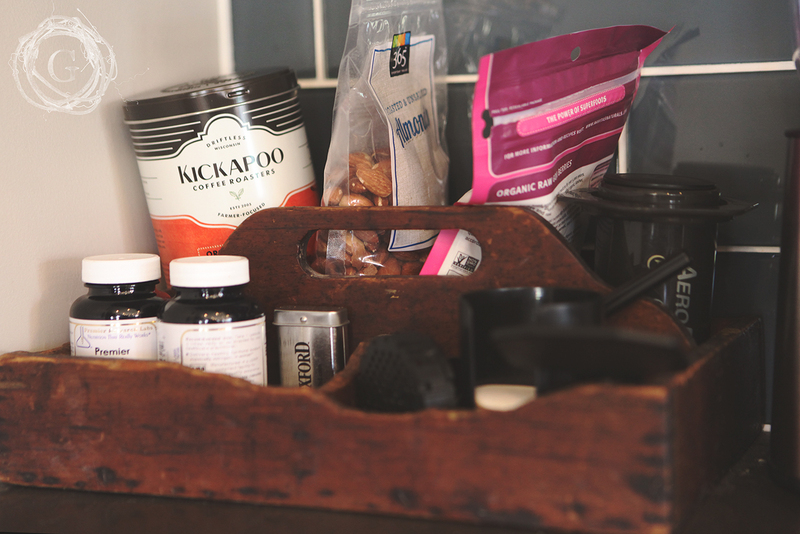 A primitive tool box holds our coffee and snack items on the counter, keeping things in their place. 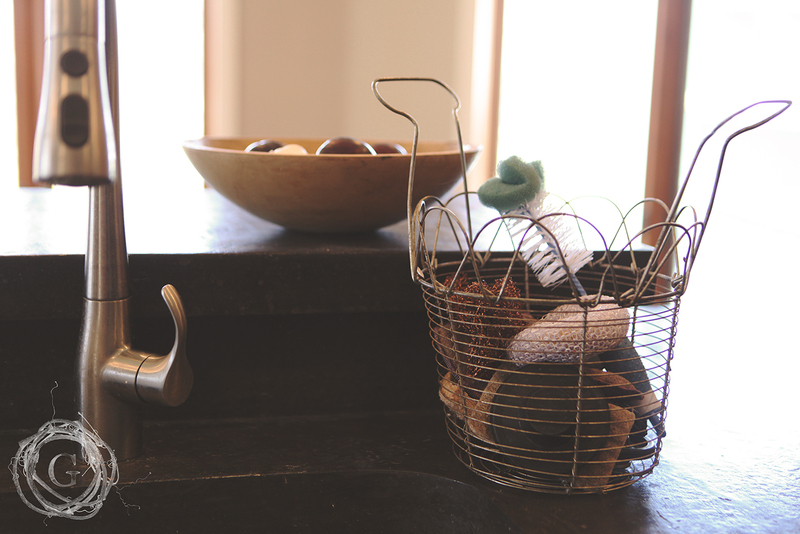 An old egg basket and a primitive hand carved wooden bowl are put to good use on our counter. As much as I love history and heritage, I have very few items from my family’s past…this radio and record player is from my great grandfather and came from East Germany, so I definitely treasure this piece and it gets a place of honor, right below John’s dad’s beautiful carving. I love Red Wing crockery and it is highly collectable. I’m very picky about which pieces I invest in, and they all get put to good use holding everything from toys to garden gloves to roller skates. Decorating your home with antiques is an incredibly fun and resourceful place to put some creative energy but be careful to not let it visually or financially take over your life. 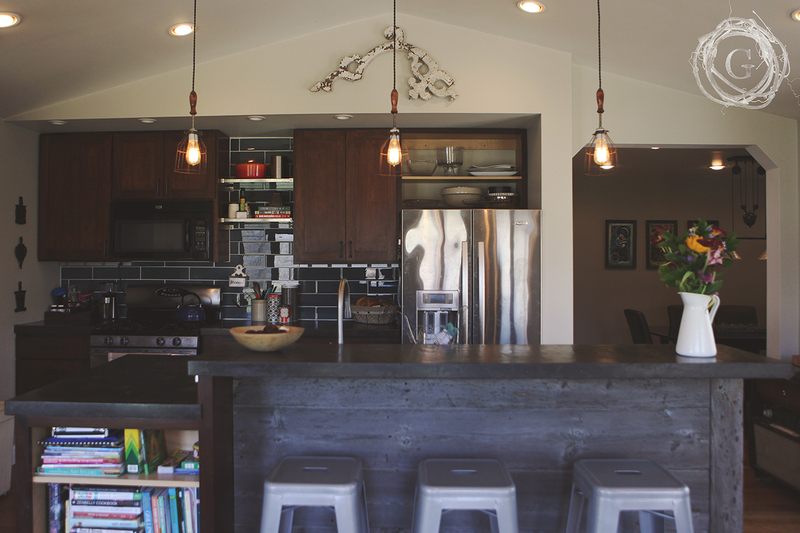 Try to stick mostly to pieces that are practical and usable, that add to the decor and the efficiency of your home. Research and take time to figure out ahead of time what pieces are must buys if you ever find them and keep that list small. Restrict yourself on how many pieces you can have by keeping your storage options limited. Figure out your favorite design/historical period and try to only choose pieces that work within that aesthetic. Stay tuned all month for more articles related to antique and vintage finds!